I’m guessing you have a woman in your life who is wonderfully disciplined, active, and passionate about health. I know I do! The best gift you can give is the gift of wellness. Your friend or loved one will be delighted. For the active lady on your list, we have compiled fit gifts especially for her. We know she’ll love them just as much as she loves her green juice or her favorite yoga poses! Before you judge me for including the most boring gift idea ever on this list… hear me out! These are special socks! Not only are they well-made, incredibly comfortable, and totally breathable, Bombas donates a pair of socks to a homeless shelter for every pair you purchase. These socks have become our family’s FAVORITE socks. They make all styles for all genders and ages, but the athletic socks are particular favorites. Once you try these, you won’t want to wear anything else… and I guarantee you that the exercise-a-holic on your shopping list will feel the same! Confession time: I love water bottles. I think I am actually more motivated to drink more water when it’s in a cute bottle. We have approximately 25 in the cupboard above the fridge, but I LOVE my S’well water bottle the most. It fits easily in my purse or backpack, and it’s SO CUTE. They come in all colors and patterns, so you can definitely express some personal flair. For the girl who loves to get in her full 8 glasses a day, this is the perfect companion for the office or gym. Finally, every active girl needs a Pikle bag packed with all of her must have items. It fits perfectly in a backpack, gym bag, or can even attach to a bicycle. Stuff it with the Essentials Pak so she’ll be ready for a scraped knee and wipes to clean off sweaty palms. If you need more space for other gear, the Bundle may be a better fit! Either way, we have a holiday sale happening that will make your shopping easy and affordable. Check it out! So, I think athleisure is here to stay. And as a mom of a two-year-old, I’m okay with that! I live for cute and comfortable yoga pants and these monogram leggings have me swooning. It’s a cool personal touch to something that could otherwise feel boring… I mean, how many pairs of black yoga pants does one really need? Okay, okay… a thousand. I want them all. Headbands are another one of those things where you just can’t have too many! But for the active girl, quality does matter. Finding a headband that looks great and keeps hair in the right place is definitely a must. I especially love the headbands made by LuluLemon. They’ll keep your hair in place for even the most intense cardio or yoga workouts, but you can also rock it confidently at the grocery store. Let’s be honest, I probably rock it more at the grocery store than the yoga studio. But it’s fine. I hope this helps give you a couple of ideas for the active women in your life. Have a safe and healthy Holiday Season! 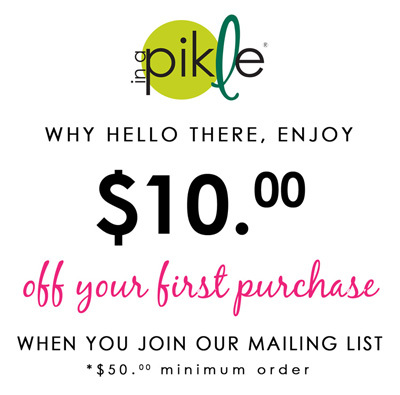 This entry was posted in In A Pikle and tagged active, bombas socks, bundle, Christmas, exercise, gift, girl, girlfriend, holiday, lululemon, monogram leggings, pikle, present, s'well water bottle, stocking stuffers, under $20.